Casa de Campos could be the definition of “The land of opportunity”. The 2 bedroom 2 bathroom home sits on 8 acres and is one of the most versatile properties on the market today. 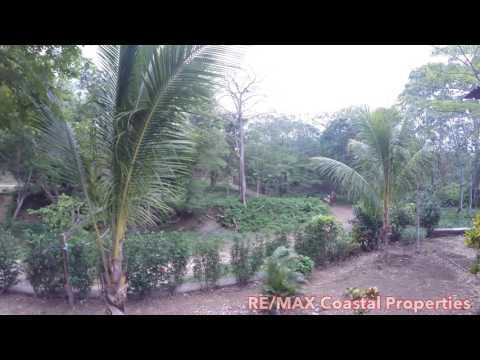 This 8 acre property lies 15 minutes from San Juan Del Sur, a straight shot down the Chocolata road into town. Located only 600 meters from the Marsella turnoff, it is 8 minutes to the calm swimming beach of Playa Marsella and the ever popular surfing mecca of Playa Maderas. Entering the property the quaint 2 bedroom home immediately captures ones eye, resting in a commanding elevated position near the private entrance to the property. The living area encompasses one large open plan space, plenty of room for all your needs, be it relaxing or entertaining. The two bedrooms are directly off the living area, with the mater bedroom having a full ensuite, and an additional bathroom opening to the family room. One may enjoy the cooling breezes on the expansive wrap around deck, set a-mist a colorful garden and soaring native hardwood trees which provide plenty of shade in the midday heat. A variety of mature tropical fruit trees surround the home and the terraced vegetable gardens to the rear have been engineered to provided optimal efficiency and productivity, with imported rich volcanic soil. The highlight of Casa de Campos is the beautiful open meadow behind the home, over 6 acres in size, gently rising to the crest of the hill, offering over 200 meters of delightful valley views, with Pacific Ocean views in the distance, all of which may be utilized for a perfect ocean view development. The hill then drops down into a lovely flat meadow, ideal for horses and corrals. The options with this magnificent piece of property are many. For the family its a rare offering these days to find such a delightful homestead so close to town, a home with 8 acres and for the opportunist there are many build able areas offering the coveted Ocean views or perhaps the yogi’s out there will appreciate the “Zen” and take advantage of the peaceful setting and tranquility, truly a land of opportunity! With 60 meters of road frontage, the option for a commercial store on the main road unlocks more value too!